Mobile computing is the tipping point of the Information Revolution. The rise of mainframe, mini, desktop and netbook computers was merely the warm-up act for the main game. And, if you thought things had changed a little recently, well… get ready for more disruption and opportunity. In this episode of the Ideas Architect Podcast we share a Book Rapper issue based on the big idea, the big trend of mobile computing. 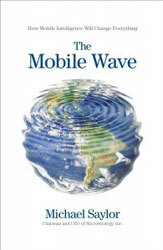 In particular we share the key ideas from Michael Saylor’s fabulous book The Mobile Wave. Essentially, we’re currently living in the third great human revolution: the Information Age. And, it’s about to tip. Mobile Computing in the guise of your smartphone and tablet are changing all the rules. Paper, entertainment, money, meeting people, medicine, education and the world around us are all about to flip. Forget the web. The new centre of the universe is where ever you are. This episode is a big heads-up! It’s your chance to be on the front of the next wave of human innovation, revolution and wealth. It’s time to rethink who you are and how you work to ride it to future prosperity. Don’t say you weren’t told!